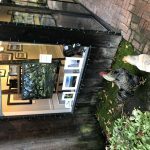 Quirky things to do in Seattle | Tracie Travels The misadventures of a restless photographer. Travel photographer and travel blogger, Tracie Howe, wanders the globe seeking out new adventures and photo opportunities to blog about. Join her for a unique perspective on travel, travel photography, and travel tips. I do things a little differently here at Tracie Travels. Sure, I like to check out the must-do things when I visit a place, but I’m also very drawn to the more offbeat things that a place has to offer. After all, there are often pretty interesting photography opportunities to be found in such places! 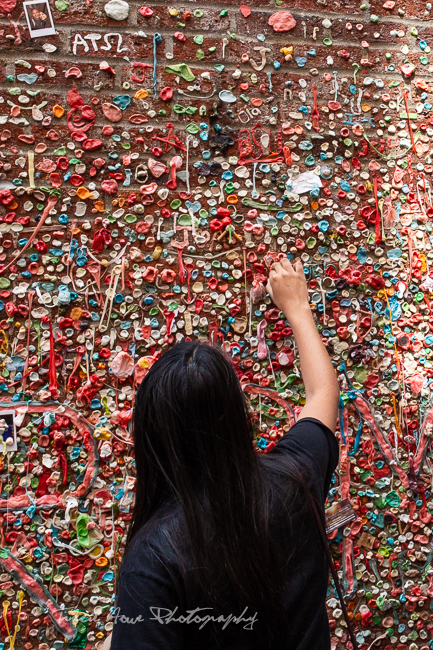 Even some of Seattle’s biggest attractions are a bit quirky. I mean, the Space Needle is basically an elevator up to a space ship, right? We’re all familiar with this Seattle landmark. 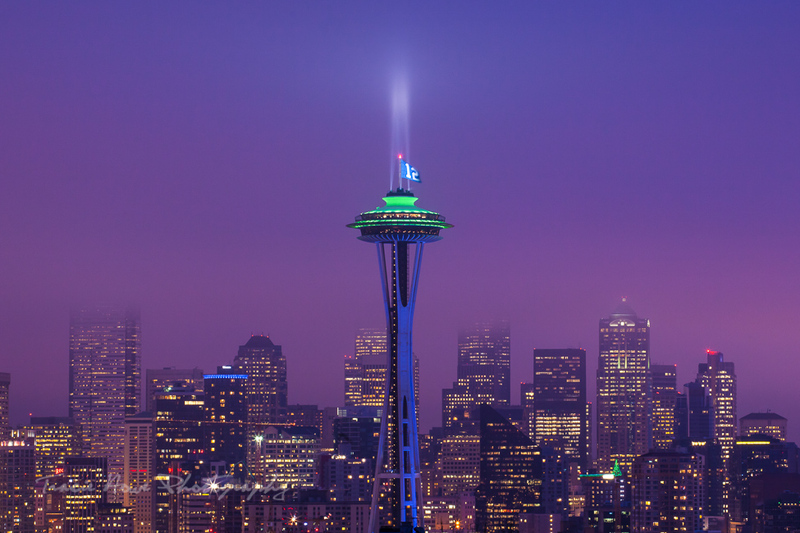 It was built for the World’s Fair in 1962 and remains Seattle’s most beloved icon. Recent renovations at the Space Needle showcase views of the city like never before – through floor to ceiling glass walls and now a rotating glass floor! 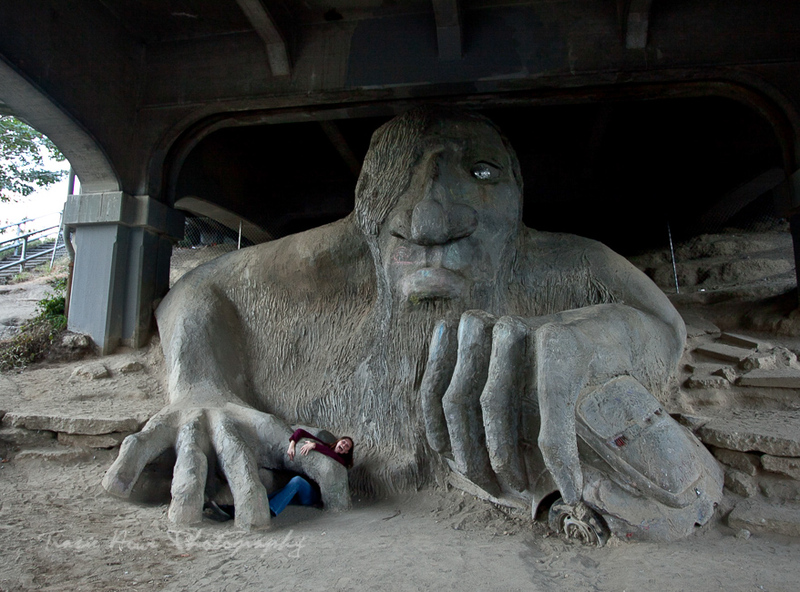 One must play at the troll to get the complete experience! Seattle’s Museum of Pop Culture, MoPOP for short, is funky from the outside in. The architecture is so over-the-top that it’s hard not to appreciate the crazy curves and shiny colors that make up the exterior. Inside is a heaven for sci-fi/fantasy geeks and music lovers alike, with permanent installations and special exhibitions on display. Seattle’s unusual history is revealed in this Underground Tour, where the city streets used to be. It’s a dark and mysterious window into the past that shouldn’t be missed during a visit to Seattle! Seattle adores its animals, but a few fur-loving proprietors have gone a step beyond “dog-friendly” outside seating. Norm’s is one of my favorite places to eat in Seattle. Not only is the food great, but the company is exceptional. Even inside! Dave and I, formerly residents of Fremont and dogless, would eat there often to get our dog and hamburger fix. The Seattle Barkery is a food truck for dogs! This truck parks wherever the dogs go, including off-leash dog parks and farmer’s markets around town. 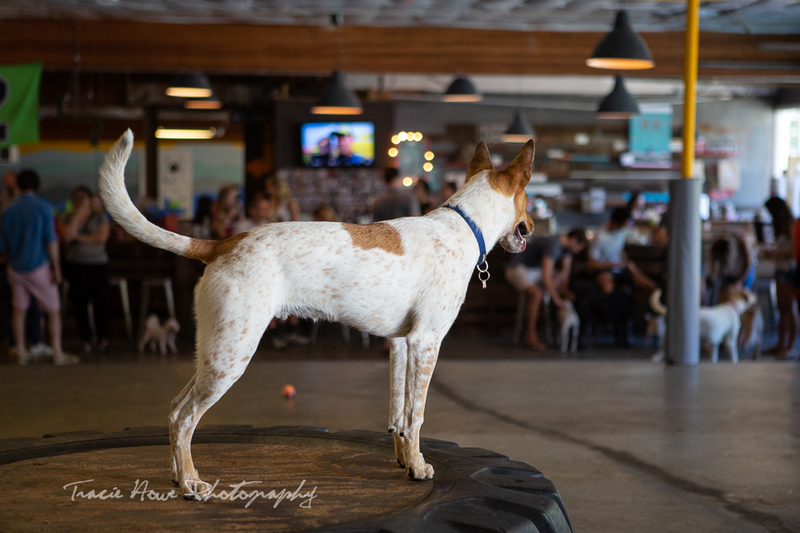 They even have a permanent treat bar set up at the Dogwood Play Park, an indoor/outdoor dog park and bar… for people too. Chex checking out the bar scene at Dogwood. Here’s one for the cat people! 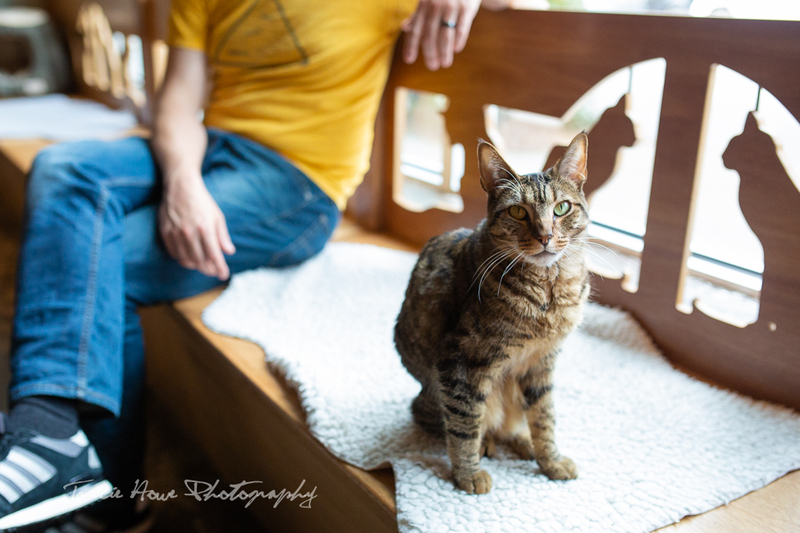 Seattle Meowtropolitan offers a cafe along with reserved cuddle time with resident kitties. Adopting is an option too! You can also sign up for cat yoga classes if that’s your thing. Seattle is the home of the original geocache – a techy version of Letterboxing… if you’ve heard of that. The headquarters are in Fremont (no surprise there! 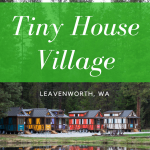 ), and while there are geocache adventures (essentially mini community treasure hunts) to be had around there, Seattle is full of Geocaching opportunities! It’s a secret world if you know where to look. Check out apps that pinpoint geocaches in Seattle and places all around the world! Have you ever secretly dreamed of running away to join the circus? I haven’t either. But if you have, now you can get a taste of that life without being disowned by your family! Learn how to fly on the trapeze, hang from silks, or just catch a fun show at Emerald City Trapeze. 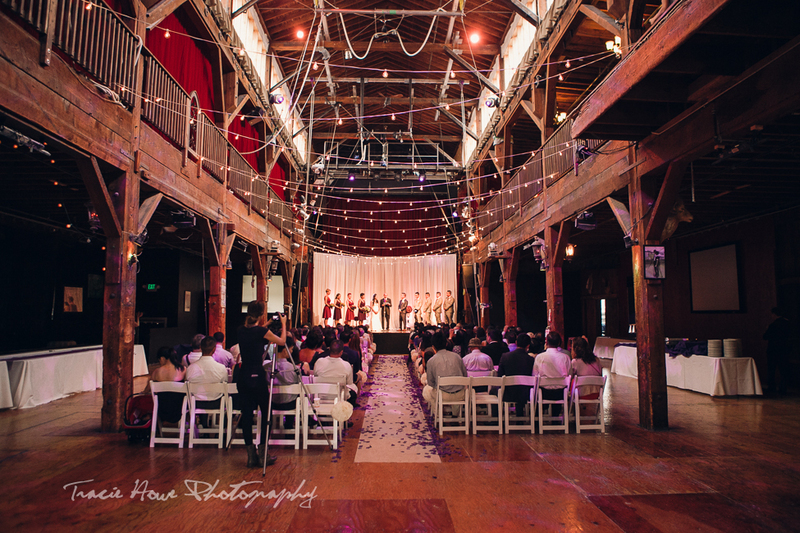 You can hold an event at this unique venue as well! From a wedding I photographed there. We have several of these all over the city to indulge your inner geek! Some provide coffee and tea while others also serve alcohol and food. Each place offers a massive collection of board games to try out while you partake in your beverage or food of choice. 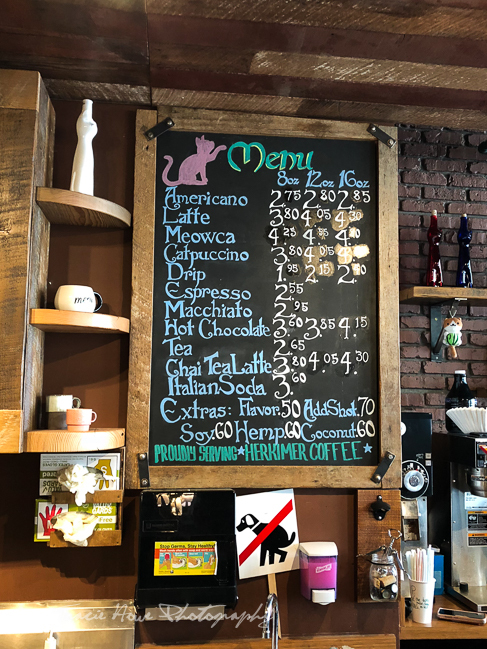 I prefer West Seattle’s Delridge Gameporium, connected to Uptown Espresso – another personal favorite of mine! Bring your earplugs, but leave your change behind! 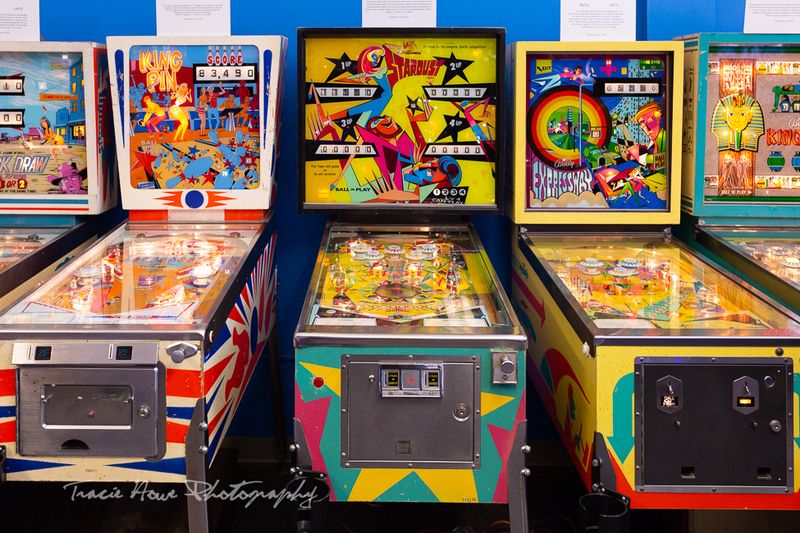 Seattle Pinball Museum gives you access to all (well, most) of the games upon admission. Museum it truly is, with games dating back to the 60’s! Since 1899, this delightfully odd gift shop has been a Seattle favorite. It’s location on the beautiful waterfront makes it a convenient place to pop in for souvenirs or a gawk at the oddities. You’ll find everything from mummies to a coin-operated fortune teller, all right next to the Space Needle postcards! If you’re looking for something equally obscure to take home from Seattle, you may very well find it here! Archie McPhee carries novelty gifts and the quirkiest of items for anyone with a fun personality. Here you can find all things unicorn, rubber chicken, or even underpants! The sky seems to be the limit at Archie McPhee! From one of my more unique engagement shoots! 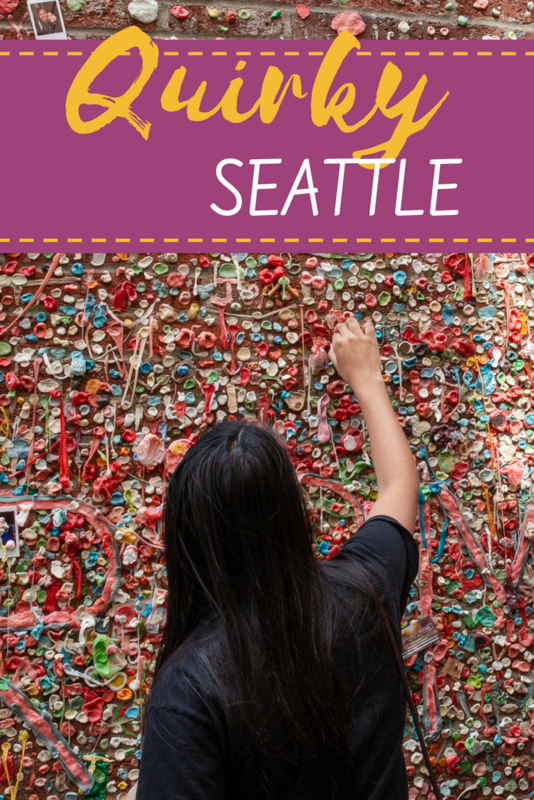 And for the must-do and see things in Seattle, be sure to visit this post. 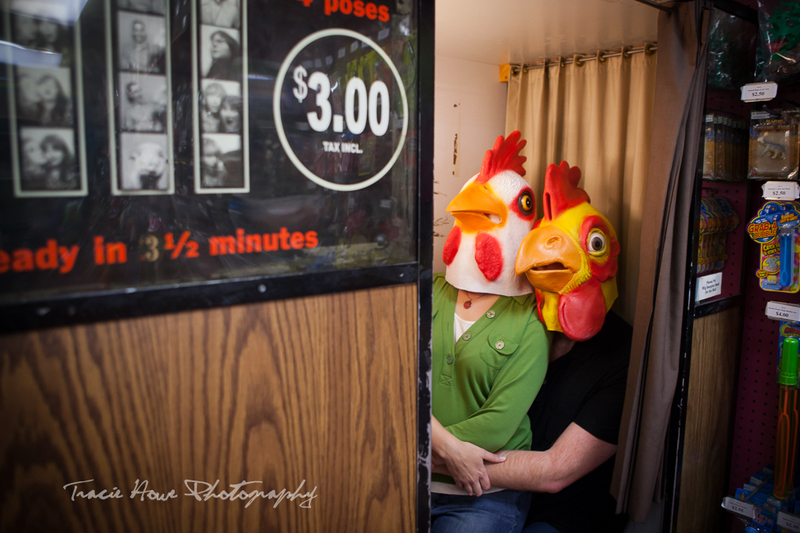 Seattle certainly is weird and wonderful, but every city has a quirky side. What are some oddities that your city has to offer? 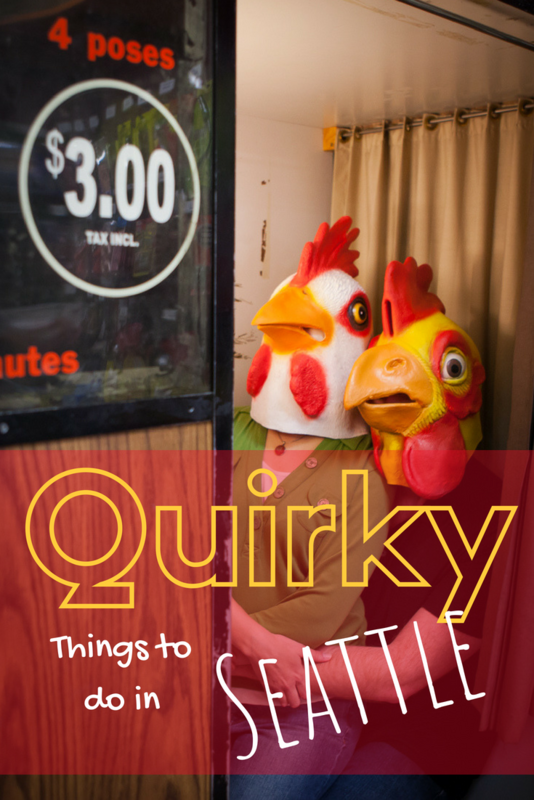 Or, perhaps there are other quirky things to do in Seattle worth mentioning? Share it in the comments!